What Is The Process To Register My Boat? How Long Do I Have To Register My Boat? Can I Renew My Boat Registration Online? A bill of sale is required for all vessel purchases. If a bill of sale is not available, you must complete an affidavit listing the amount you paid for the boat. If the vessel is currently (or ever has been) registered, whether in Alabama or another state, be sure to bring a copy of the most recent registration if possible. Annual registration fees for vessels are based upon the length of the vessel, and are not prorated for partial year registration. Therefore, the cost is the same whether purchasing a registration for one month or an entire year. However, no ad valorem tax is assessed on vessels, and there are no late penalties for the registration or renewal of a vessel. When transferring ownership of a vessel with a valid Alabama registration decal, the initial transfer fee will be $5.00, plus any applicable sales tax. If the vessel has been previously registered in Alabama, but the registration has expired, a $5.00 transfer fee, plus the registration fee, plus applicable sales tax will apply. When registering a vessel in Alabama for the first time, the yearly registration fee, plus any applicable sales tax will be due. A new Alabama registration number will be assigned upon registration. Although there are no late penalties collected by the License Office for the registration or renewal of a boat, the Alabama Marine Police places certain limitations on the period of time an owner has to register a vessel in his or her name. There is a 72 hour grace period for the registration of a new boat. If you purchase a used boat that is currently registered in Alabama, you must make application for transfer within 15 calendar days of purchase. There is no grace period for a used boat that does not have a valid Alabama registration. If you purchase a used boat with an expired registration, you MUST currently register the boat before it is placed in the water. Remember: The only way to guarantee that you do not receive a ticket for not having a boat registered in your name is to register the boat in your name before placing it in the water. The Alabama Department of Conservation and Natural Resources offers online renewal of boat registrations through its website at www.outdooralabama.com. Other types of transactions (first-time registrations, transfers, replacements and duplicates) must still be processed in person at the License Office. 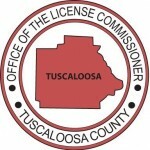 Please be aware that you will not receive a renewal notice from the Tuscaloosa County License Office the next year if you renew your boat registration online because the renewal will not be in our registration system. The Alabama Marine Police is responsible for the promulgation and enforcement of all boating regulations. Additional boating information can be found online at www.outdooralabama.com, the official website of the Alabama Department of Conservation and Natural Resources. There, you can also find a variety of other subjects from hunting and fishing license information and requirements to information on state parks and more. You can even buy hunting and fishing licenses online at www.outdooralabama.com! To get information concerning licenses to operate vessels, please visit the Alabama Law Enforcement Agency’s website at www.alea.gov. If you have any questions regarding boat registration, please call (205) 464-8235.